Well it doesn’t work with Rosita,Gov,Daryl,Dwight,rick,Tara, and Carl and my non heroes! So that leaves it ‘workin’ For Sasha Merle Rufus and Maggie !! Is he in lead position? It should still work on himself if he’s not leader, but only him. It's only a visual glitch. Even if his bonus isn't showing it'll still be working. Hero in leader position bonus works for the whole team. Hero not in lead position, their bonus only applies to themselves. It helps visualize, but all leader trait dialogue boxes are now a double statement. 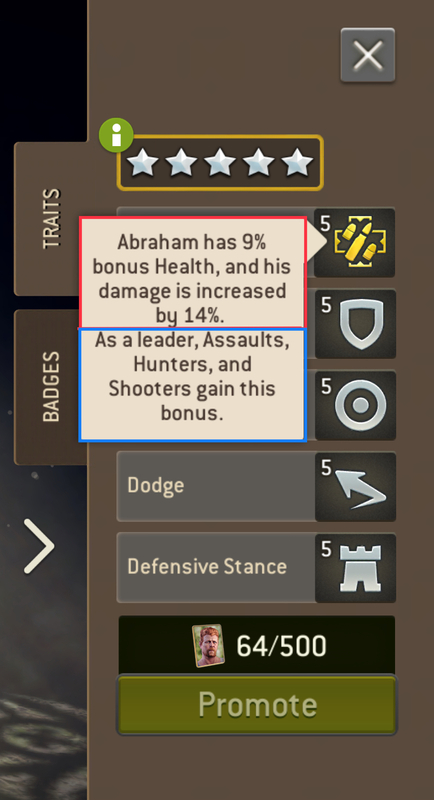 It used to say "As Leader" and the trait description. Now it's description + "as leader"
It all helps. I appreciate it!